January Harriers 8K - Results: Sick with the flu. January Mill Bay 10K - Results: Sick with the flu. February Cedar 12K - Results: Plan to participate and not race. February Hatley Castle 8K - Plan: Run as fast as possible. March Comox half-marathon - Plan: Run to finish. April Port Alberni 10K May Bazan Bay 8K. 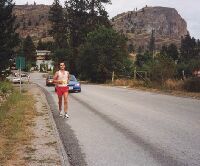 In 1999 my training was going great until I sufferd a sprain in my right knee - medial collateral ligament (MCL)in late January. That injury put me out for ten weeks (nine months to get back on track). I have been recovered from injury and illness and as of October of 1999 am returning to form by running four days per week, swimming five, exercise bike and weights, three days per week and the occasional weekend bike ride. 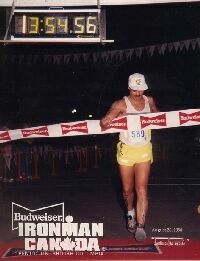 As of January 26, 2000 I've just recovered from a three week flu/cold and am now rebuilding my endurance for the races in March. Ease into four days running; four days bike/exercise bike, four days in the pool and three days weight training. Base training for UBC triathlon adding some speedplay runs and raising the intensity of training. Running is the base of my program since I have fat to lose and wish to improve my cardiovascular system. I weigh @192lbs on a 5'11" frame and my optimal race weight is @162lbs. Eventually I'll run five days per week: one: long slow distance, two: tempo (run as you feel), one: hilly course (not hill repeats), one: fartlek (speed play after a base month of running). My running program has been developing over the years and it does work for me. The secret to any training is: 1)Have a plan 2)Consistantly follow that plan and rework it to remain consistant taking in consideration such things as injuries, working, personal and social activities. 3)Record your workouts and nutrition in a logbook or calender or a piece of paper or in your computer or whatever works for you. I am currently using a calendar and notebook to record my workouts and plot my progress. Swim training. Not my favorite thing to do but once I'm in the pool it usually is a good workout. If you never swam as a kid then swimming can be tough. I remember learning to swim and improve over the years but it's always been a struggle. I am a much better duathlete than a triathlete. The reason I do triathlons is for the challenge and one of those challenges is to face my fears in open water swimming. Have you ever had a panic attack at the swim start of a triathlon? Very unpleasant. One of the ways to avoid it is to train, train and train. Cycling is my favorite of the three disciplines. Most of my cycling is done in doors during the winter but because I live in Victoria I try to get out on the bike when I can. I have no problem riding in the rain so the westcoast is good for training. Three days in-doors on a lifecycle or powercycle or exercise bike. One day on the road, weather permitting; one long ride. Early season training starts off slow and builds for the second phase of my training in which I keep one day for long slow workouts in each discipline and improve the speed in S B and R.
I use a heart monitor in most but not all my training. I believe a heart monitor is the best indication of keeping your training within the zone you are aiming for. This is money well spent, especially if your serious about improving and have goals to reach. Triathlon Races 2000 list with links will be forthcoming as well as a more detailed training regime.